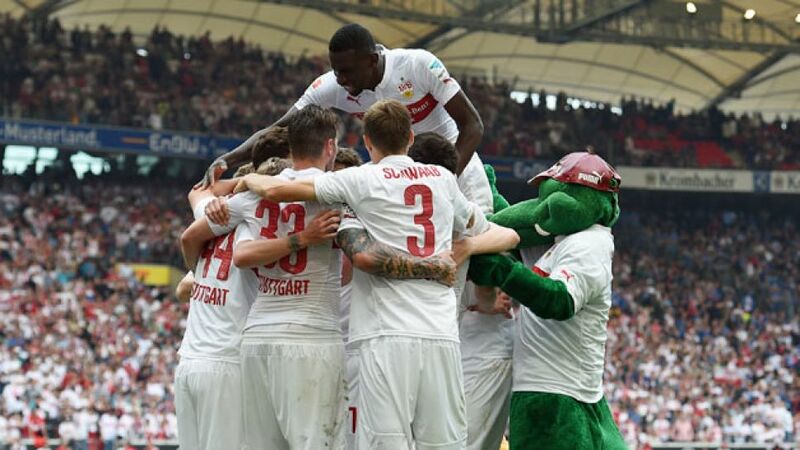 Stuttgart - VfB Stuttgart's Bundesliga fate is in their own hands following Saturday's stirring 2-1 win at home to fellow strugglers Hamburger SV. The result took the Swabians out of the automatic relegation places for the first time since Matchday 19, and the club now know that victory away to bottom side SC Paderborn 07 on the final day is all that's needed to guarantee their top-flight status for another year. "I’ve really got to give my team a massive compliment for keeping a clear head after the unexpected setback, then getting the equaliser and taking the lead shortly after that," enthused Stuttgart head coach Huub Stevens. "The only thing I can accuse the team of is not making use of the further chances we had. Now we have one very important game ahead of us." Whatever happens in next Saturday's clash at the Benteler-Arena, at least one of the two basement dwellers will be relegated. Paderborn have to win if they're to stand any chance of survival, although they cannot finish higher than the relegation play-off spot currently occupied by a Stuttgart side that would drop down a tier with defeat. A draw would definitely spell the end for Paderborn - and possibly even VfB, should second-bottom Hamburg win at home to FC Schalke 04. "It's going to be like a madhouse," warned Stuttgart midfielder Christian Gentner, the heart-on-the-sleeve midfielder's equaliser having provided the catalyst for the Matchday 33 turnaround against HSV. "We've got a final coming up now." Striker Daniel Ginczek echoed his skipper's sentiments, adding: "We've reached the interim goal of two straight wins, that's the quarters and semis out of the way. Now we want to win the final." So it's with a clear cup mentality that Baden-Württemberg's capital club go into the game that will define their season. Given their earlier toils, few would have expected them to get this far and still be in with a shot at skipping the trapdoor, but the winds of change have been blowing hard and fast around the Mercedes-Benz Arena of late and there is now the distinct feeling that Stuttgart will be knocking around at Germany's top table for a good while yet.